It's very important to take care of your retainer and store it properly during times you’re not wearing it. Here’s how to keep it clean and damage free. If your orthodontist has prescribed full-time retainer wear, you should only remove it to eat, and to brush and floss your teeth, or to clean your retainer. If you play sports, you should take your retainer out and replace it with an athletic mouth guard to protect your teeth. If you only wear your retainer part time, you’ll have it out and stored more frequently. Place a small dab of toothpaste on your toothbrush and gently brush your retainer to remove any bacteria or plaque buildup. 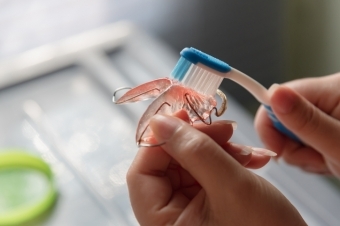 Don’t leave it lying on the bathroom counter, and don't simply wrap in a tissue while you eat; these are surefire ways to lose or damage your retainer accidentally. If you have more questions about retainer care and storage, we can help! Contact Guildford Orthodontic Centre today.